Chroma key is an established technique and has been used for decades in feature film, video and television production. The process behind chroma key has largely gone unchanged, that is until the development of Chromatte. In the past two years Reflecmedia has received numerous awards for their products, including an “Award for Innovation in Media” from America’s National Association of Broadcasters. Reflecmedia’s Chromatte fabric is designed to work in conjunction with a LiteRing. 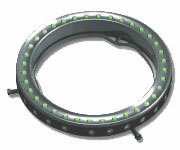 The LiteRing features Light Emitting Diodes (LEDs) arranged in a circular casing that is positioned in front of the camera lens. This provides all the light required to illuminate the Chromatte background for chroma key production. The LiteRing is a circular arrangement of bright blue or green light emitting diodes (LEDs) mounted around the camera lens. The LiteRing provides all the necessary source light required to illuminate the Chromatte fabric for keying. The system sets up around the front of your camera lens and is plugged into the LiteRing box. The LiteRing box is then plugged into the wall and supplies power for the infra-red LEDs. The LiteRing connects to the camera with a specially designed adapter ring, similar to those used for matte box mounting, which is attached to the inner thread of the lens. The LiteRing is then placed on to the adapter and simply locked with a single screw. This enables users to quickly release the LiteRing in between shots, or change from a green to a blue ring based upon their chosen keying colour. Reflecmedia has taken the blue or green colour away from the fabric and completely removed the need to separately light the background. The ability to change the background keying colour in seconds cannot be achieved any quicker – no need to hang a different drape or repaint the studio walls! Tungsten, HMI and Fluorescent lights can be large in size, expensive to power and uncomfortable to work under. Typically you require thousands of watts to light absorbent chroma key fabrics, whereas the LiteRing output of around 10 watts provides all the light required by Chromatte. These LEDs are what ‘light up’ the blue screen material. It’s covered in a glass substrate so try not to touch or damage the surface of the bluescreen material. Chromatte is a fabric designed specifically for use as a background for chroma key production. Chromatte fabric is the core behind the Chromatte techology, in conjunction with the LiteRing, the Chromatte provides the camera a perfectly even blue or green ideal for chromakeying on. Unlike conventional chroma key fabrics that are usually blue or green in colour, Chromatte is grey to the eye in ambient light. The fabric contains millions of tiny glass beads that act as reflectors, returning any light shone on them back to it’s source. The Chromatte Fabric does this by being made up of millions of microscopic glass beads that form hemispherical mirrors; no matter where the light comes from, it always gets reflected back at it’s source. Since the light coming from the LiteRings is green or blue, the light reflected back at the camera is green or blue, no matter what lighting conditions exist on the stage. Even pitch black, angled, wrinkled, or crumpled fabric can’t dissuade the chromatte fabric from a good key. The intensity of the light emitted from the LiteRing can be adjusted with the LiteRing Controller. As a rule the LiteRing should be set to medium output and adjusted as required based upon distance and keying device, to achieve optimum results. Traditional chroma key often requires that you relight the background for each camera set up. With the LiteRing attached to the camera you can move from 90 degrees head on, to approximately 10 degrees from horizontal only requiring a slight adjustment on the LiteRing Controller to effect a key. Ideal shooting distances depend on a number of variables including levels of ambient light, choice of keying applications, camera quality and filming formats. As a rule the subject should be further than 2-3m (8′) from the camera to avoid a blue or green cast of light. Maximum distance rises up to approximately 20m (60′). Quick, simple, effective and achieves consistent results. The LiteRing is fixed to the camera and is positioned fractionally behind the front of the lens. Reflecmedia’s ChromaFlex takes the Chroma key shoot out of the studio. Lightweight and detachable in seconds, if you want to change from a blue to a green key you simply unscrew and replace with a different coloured LiteRing. Chromatte drapes and panels can be custom manufactured to fit almost any environments. The LiteRing is a mains powered and adjustable light source, made up of blue or green LEDs, arranged around and close to the centre of the camera lens (known as the ‘centre axis’). Reflecmedia’s LiteRing colour determines whether the production is shot against blue screen or green screen. Should circumstances change and the alternative colour be required, the LiteRing can simply be exchanged. No need to repaint or relight. Chromatte can be installed into the largest of studios or the smallest office. There is no ‘spill’ in a Chromatte installation. Unlike conventional Chroma key installations, a Chromatte installation takes very little time, therefore allowing extra time to concentrate on lighting and composing the scene.